The 1991 Russian presidential election was held in the Russian SFSR on 12 June 1991. This was the first presidential election in the country's history. The election was held roughly three months after Russians voted in favor of establishing a presidency and holding direct elections in a referendum held in March that year. 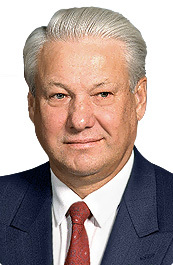 The result was a victory for Boris Yeltsin, who received 58.6% of the vote. In the election of the Supreme Soviet of the Russian Federation's lower chamber members in the 1990 legislative election anti-communist candidates won nearly two-thirds of the seats. On 31 May 1990 Boris Yeltsin was elected Chair of the Supreme Soviet of the Russian Federation in a vote by the body's members. This made him the de facto leader of the Russian SFSR. The vote had been relatively close, as Soviet Union leader Mikhail Gorbachev had unsuccessfully tried to convince enough members of the Supreme Soviet to vote against Yeltsin. Yelstin made an active effort to push for the creation of an office of president and for a popular election to be held to fill it. Many saw this as a desire by Yelstin to have a mandate and power separate from the tensely divided legislature. He ultimately succeeded in having Russia hold a referendum on 14 March 1991 on whether Russia should create offices of President and Vice President and hold elections to fill them. Russians voted in favor of creating and holding elections to these offices. Following the referendum, there was a period of more than a week in which a stalemate had caused the Congress of People's Deputies to go without deciding whether or not to vote on whether the Russian Federation should have a directly-elected president. On 4 April the Congress of People's Deputies ordered the creation of legislation to authorize the election. While still failing to set an official date for the election, the Congress of People's Deputies provisionally scheduled the election for 12 June. This provisional date would later become the official date of the election. Ultimately, the Congress of People's Deputies would approve for an election to be held, scheduling its initial round of voting to be held roughly three months after the referendum had been decided. The election would jointly elect individuals to serve five-year terms as President and Vice President of the Russian Soviet Federative Socialist Republic. Several sub-national elections were scheduled to coincide with the first round of the presidential election. This included mayoral elections in Moscow and Leningrad, and executive elections in federal subjects such as Tatarstan. There were also sub-national referendums scheduled to coincide with the presidential election. These included a number of referendums in which cities were determining whether or not residents wanted to revert to their historic city names, such as in Sverdlovsk (historically Yekaterinburg) and Leningrad (historically Saint Petersburg). In difference from subsequent Russian presidential elections, a vice presidential candidate stood for election alongside with the presidential candidate. Similarly to the US presidential election system, the candidature of Vice President was exhibited along with the candidacy of the President as a joint entry on the ballot paper. Preliminary legislation outlining the rules of the election was passed on 24 April by the Supreme Soviet of Russia. However, it ultimately took the Supreme Soviet until three weeks before the day of the election to finalize the rules that would govern the election. Any citizen of the RSFSR between the ages of 35 and 65 were eligible to be elected president. Any citizen of the RSFSR over the age of 18 was eligible to vote. 50% turnout was required in order to validate the election. The winner would need to have captured 50% of the votes cast. The president would be elected to a 5-year term, and could serve a maximum of two terms. Originally, the election law stipulated that, once sworn-in, the president would be required to renounce their membership of any political parties. However, on 23 May, the parliament voted to remove this requirement. All candidates needed to be nominated before they could achieve ballot registration. Candidates could be nominated by RSFSR political parties, trade unions, and public organizations. There were two ways for candidates to achieve ballot registration. The first was by providing proof of the having the support of 100,000 voters (a signature drive). The second way for candidates to obtain registration is if they received the support of 25% of the members of the Congress of People's Deputies (which would vote on whether or not to add such candidates to the ballot). On 6 May it was announced that the deadline for nominations would be 18 May. This was also the deadline for nominating a vice-presidential running mate. Candidates were provided 200,000 rubles in public financing for their campaigns. In May 1991 there were some calls to postpone the election, rescheduling it for September. Those urging the postponement of the elections argued that the time before the scheduled 12 June election day provided too brief of a period for nominating candidates and campaigning. In response to these calls, election commission chairman Vasilii Kazakov argued that that the law stipulated that the election would be held on 12 June and that the proposed postponement of the election would only serve to "keep Russia seething" for another three months. In mid-May election commission chairman Vasilii Kazakov announced that the election would be budgeted at 155 million rubles. The results of the first round were to be counted and announced by a 22 June deadline. It had ultimately been determined that, if needed, a runoff would be scheduled to be held within two weeks after the first round. Due to the rushed circumstances behind the creation of the office and organization the election, many aspects of the office of President were not clear. Sufficient legislative debates were not held to outline the scope of presidential powers. It was unclear, for example, whether the President or the Congress of People's Deputies would hold ultimate legislative authority. One of the few stipulations that was made was that a two-thirds vote in the Congress of People's Deputies had the power (only if such a vote were recommended by the newly-created constitutional court) to remove the president if they violated the constitution, laws, or oath of office. Work on drafting a law to outline the presidency itself began on 24 April, with approximately two months until the inaugural holder was set to occupy the office. Under the initial draft the president was the chief executive in the RSFSR, but did not have the right to dismiss the Supreme Soviet or the Congress of People's Deputies or suspend their activities. The President could not be a people's deputy and, once elected, would have needed to suspend their membership in all political parties. On 25 May the newly-founded conservatives group in the Congress of People's Deputies blocked legislation championed by Yeltsin that would have explicitly allowed the president to remove local executives from office if the RSFSR Constitutional Court found them guilty of violating Russian Federation laws. The Supreme Soviet committee that had been tasked with redrafting the Russian Constitution deadlocked over the powers of the presidency. Attempts to reach a single resolution would continue after the election. By November, the committee would give up on reaching a single resolution, and opted to instead present two different drafts, one created by Yeltsin allies and one created by Yeltsin opponents. Neither of these would be approved. The failure to resolve these matters would ultimately lead to the later eruption of the 1993 Russian constitutional crisis. Although Yeltsin ran as an independent, he was supported by Democratic Russia. Despite the fact that four candidates were members of the Communist Party, Nikolai Ryzhkov was the only one who was officially nominated by the party. The other communists participating in the election ran as self-nominated candidates. Yeltsin was the vast favorite to win the election. Rather than coalescing around a single candidate to challenge Yeltsin, the forces of the Soviet Communist establishment instead fielded a number of candidates (with Ryzhkov being their official candidate). Since no candidate was believed to have a chance of outright defeating Yeltsin in the first round of the election, Communists hoped that a wider field of candidates would increase the odds that they could siphon enough support away from Yeltsin that they could force the election into a runoff (which would occur if no candidate captured more than 50% of the votes cast). Communists believed that the political climate in Russia might be different by the fall, and perhaps less favorable to Yeltsin. Thus, they wagered that, by the time that a runoff vote would be held, Yeltsin might be in a weaker position as a candidate. Ultimately, Yeltsin succeeded in capturing a majority of the votes cast in the first round, negating the need for a runoff to be held. Having an immensely comfortable lead, Yeltsin ran a relatively low-intensity campaign. Rather than heightening rhetoric and rallying voters, Yeltsin took a far more relaxed approach, taking very few shots at his challengers and offering very little specifics in regards policy. In contrast, his opponents, trailing Yeltsin's gargantuan lead and having very little time left to decrease their deficit, took many shots at him and at each other. While widely celebrated both in Russia and abroad as a breakthrough in Soviet/Russian democratization, the election was not entirely free and fair. Nevertheless, many commentators have regarded the 1991 elections to have been more free and fair than all subsequent Russian presidential elections. Several candidates' campaign apatatuses continued to campaign after the time limit on election day, after which they were supposed to cease campaign activities. Zhirinovsky unsuccessfully attempted to contest the results of the election, accusing Yeltsin of using the resources of his office to assist his own campaign effort. He alleged that such resources went above what candidates could afford using the permitted public financing, and thus should be considered a campaign finance violation serious enough to nullify Yeltsin's victory. Despite officially remaining neutral and endorsing no candidate, Soviet leader Mikhail Gorbachev sought to prevent a victory by frontrunner Boris Yeltsin. Gorbachev attempted to convince more candidates to run. He did this in a hope that a greater number of candidates would increase the likelihood that other candidates would be able to siphon enough support away from Yeltsin that his vote share would be under 50%, thus ensuring that a runoff vote to be held. Despite the fact that the military was supposed to have been depoliticized, its decisions were still orchestrated by the CPSU. Thus, the military was utilized in the CPSU's attempt to stop Yeltsin from winning the election. On 30 April Colonel General Nikolai Shlyaga, chief of the Main Political Administration, told representatives of that body that the army should be working to influence the outcome of the RSFSR presidential election. Shlyaga called for the establishment of election committees and urged that servicemen be briefed on the relative merits of the presidential candidates. This was perceived to be an army-sponsored campaign against Boris Yeltsin. In early June, the Defense Ministry issued a directive to commanders in the city of Arkhangelsk forbidding "spy-democrats" from campaigning for the RSFSR presidency among military units. This blocked pro-Yeltsin forces from conducting campaign activities directly targeting military votes. Meanwhile, such campaigning in support of Ryzhkov continued to be allowed. On the eve of the election, in what was seen as a politically-motivated move, the chief Soviet prosecutor announced that he was looking into currency violations by Yeltsin. The 11 June edition of Sovetskaya Rossiya featured a front-page article written by Nikolai Trubin, the Procurator General of the Soviet Union, which denounced Yeltsin for illegal offers to sell millions of rubles for dollars at several times the official rate. This was a deal that was never implemented, but for which then-RSFSR Deputy Prime Minister Gennadii Fil'shin had resigned the previous February. Actions to sway the election against Yeltsin were not perpetrated solely by officials in Soviet Union government. Conservative members of the RSFSR government also took similar actions. On the eve of the election, RSFSR Foreign Minister Andrei Kozyrev (a conservative government figure) came forward to claim that allegations that Yeltsin had appointed an alleged Italian mafioso as RSFSR honorary consul were true. There was a significant media bias in favor of Ryzhkov. Communist media outlets, particularly towards the end of the campaign, attacked Yeltsin, accusing him of authoritarianism and incompetence. Many newspapers also had a strong bias favoring Ryzhkov; two days before the election, Pravda published a strong attack on Yeltsin calling him, "disloyal, authoritarian and incompetent." Pro-Yeltsin publications (and, occasionally, anti-Yeltsin publications) were critical in their coverage of Zhirinovsky. They belittled his candidacy and characterized him variably as "possessed" as well as a brownshirt (Nazi), fascist, chauvinist and Stalinist. The coverage varied between Russia's two major television channels. The RSFSR-run RTR gave positive coverage to Yeltsin, while the central Soviet government-run ORT criticized him and provided broad coverage to the views of his opponents. ORT cast biased coverage of proceedings in the Russian legislature, broadcast a lengthy documentary on Ryzhkov shortly before the election, and also broadcast many anti-Yeltsin programs. It also largely disregarded the candidacy of Zhirinovsky in its coverage, allotting him just 2.5 hours of coverage to him against the 24 hours of coverage given to Yeltsin. On 27 April Leonid Kravchenk, Chairman of the USSR State Committee on Television and Radio Broadcasting and the All-Union State Broadcasting Company, banned a scheduled broadcast by RSFSR TV (operator of RTR), a media entity of the RSFSR government which had been irregularly broadcasting since the previous year. It was soon reported that Kravchenk might possibly try to violate his agreement with the Russian government and block regular broadcasts by RTR during the campaigning period, depriving Yeltsin's government of their own state media outlet to utilize as a campaign tool. However, the station was allowed to launch its regular broadcasts on 13 May. Nevertheless, in many places, local communist authorities interfered with the signals of pro-Yeltsin broadcasts by the network. There was no signal interference experienced by ORT's anti-Yeltsin broadcasts. A number of procedural irregularities were reported by the Russian press. Some ballots were distributed which had mistakenly been printed without a seal containing the signature of an electoral commission member on their reverse sides. Consequentially, votes cast with such errant ballots were deemed void. Additionally, one ballot printing location in the Moscow Oblast printed 25,000 ballots which had mixed up presidential and vice-presidential candidate pairings. Several campaigns saw acts of sabotage during the campaign period. On May 16 an explosion occurred in room being used to store the signatures being gathered for Yeltsin's candidacy at the Democratic Russia headquarters in Moscow. The Baltimore Sun called it "the first political bombing in the capital for more than a decade." Sovetskaya Rossiya placed blame on the Libertarian (Radical) Party of the Soviet Union for perpetrating the attack, however they denied involvement. A stand at the building of Orenburg's socio-political information centre containing Ryzhkov campaign material was destroyed. On 28 May the Tatarstan Supreme Soviet declared that Tatarstan would not "officially take part" in the election. This came following two weeks of public protests against the election in Tatarstan. There was strong political opposition in Tatarstan to the election, as it was regarded as infringing upon Tatarstan's claim to sovereignty. As a consequence, turnout in Tatarstan was 36.6%. Meanwhile, the election for President of Tatarstan (held the same day) saw turnout surpassing 60%. A boycott of the election in Bashkortostan was encouraged by the newly-founded group A Movement for a Sovereign Bashkortistan. The group was jointly formed by the Bashkir People's Party and the Tatar Democratic Party of the Bashkir ASSR. Televised debates were held featuring candidates. Despite having originally agreed to participate in the debates, Yeltsin ultimately chose not to. Opinion polls indicated a strong likelihood of a Yelstin victory. On the day of the election, an analysis by The Times indicated that even the opinion polls that were the most pessimistic of Yeltsin's support still showed him garnering between 36% and 52% of the vote. Less pessimistic polls showed him garnering an even greater share of the vote. Most opinion polls showed Yeltsin far ahead of other candidates. Many showed him receiving more than 60% of the vote. On the eve of the election, many polls (incorrectly) indicated that Bakatin was going to place third. Polls failed to reflect Zhirinovsky's strong performance. Three weeks prior to the election polls showed him with only 0.5% support. Yeltsin decisively won a majority of the vote in the first round of the election, thus forgoing the need for a second round. On 13 June he was reported to have won the election by Soviet media. Vasilii Kazako, Chairman of the Central Election Commission, confirmed Yeltsin's victory. Official results were certified on 19 June. Yeltsin became the first popularly elected leader in the history of Russia. His inauguration was held 10 July. ^ McFaul, Michael (2000). "Yeltsin's Legacy". He Wilson Quarterly. 24 (2): 42–47, 50–58. JSTOR 40260037. ^ a b c d e f g h i j Depoy, Eric (1996). "Boris Yeltsin and the 1996 Russian Presidential Election". Presidential Studies Quarterly. 26 (4): 1140–1164. JSTOR 27551676. ^ a b Schmemann, Serge (June 14, 1991). "Yeltsin is Handily Elected Leader of the Russian Republic in Setback for Communists". www.nytimes.com. The New York Times. Retrieved September 16, 2018. ^ a b c d e f g h i j Englund, William (11 June 2011). "A defining moment in the Soviet breakup". www.washingtonpost.org. Washington Post. Retrieved September 12, 2018. ^ "No. 63, 02 April 1991". www.friends-partners.org. Radio Free Europe/Radio Liberty. 2 April 1991. Retrieved September 17, 2018. ^ Teague, Elizabeth (3 April 1991). "RSFSR CONGRESS PUTS OFF DEBATE ON PRESIDENTIAL SYSTEM". www.friends-partners.org. Radio Free Europe/Radio Liberty. Retrieved September 17, 2018. ^ "No. 65, 04 April 1991". www.friends-partners.org. Radio Free Europe/Radio Liberty. 4 April 1991. Retrieved September 17, 2018. ^ Wishnevsky, Julia (5 April 1991). "PROVISIONAL DATE SET FOR POPULAR ELECTION OF RSFSR PRESIDENT". www.friends-partners.org. Radio Free Europe/Radio Liberty. Retrieved September 17, 2018. ^ "REPORT ON THE RUSSIAN PRESIDENTIAL ELECTIONS MARCH 26, 2000" (PDF). www.csce.gov. CSCE. 2000. Retrieved September 4, 2018. ^ a b "No. 99, 27 May 1991". www.friends-parners.org. Radio Free Europe/ Radio Liberty. 27 May 1991. Retrieved September 17, 2018. ^ a b "No. 83, 30 April 1991". www.friends-partners.org. Radio Free Europe/Radio Liberty. 30 April 1991. Retrieved September 17, 2018. ^ a b Rahr, Alexander (10 June 1991). "SOBCHAK CAMPAIGNS". www.friends-partners.org. Radio Free Europe/Radio Liberty. Retrieved September 21, 2018. ^ Markedonov, Sergei (January 29, 2010). "The man behind the Tatarstan model". www.rbth.com. Russia Beyond. Retrieved September 17, 2018. ^ a b c d Steele, Jonathan (14 June 1991). "Yeltsin races to victory in Russian poll". www.theguardian.com. The Guardian. Retrieved September 26, 2018. ^ a b c d e "No. 101, 29 May 1991". www.friends-partners.org. Radio Free Europe/ Radio Liberty. 29 May 1991. Retrieved 16 September 2018. ^ Tolz, Vera (5 June 1991). "LENINGRAD VERSUS ST. PETERSBURG". www.friends-partners.org. Radio Free Europe/Radio Liberty. Retrieved September 21, 2018. ^ a b c d e f g h i j "No. 80, 25 April 1991". www.friends-partners.org. Radio Free Europe/ Radio Liberty. April 25, 1991. Retrieved September 17, 2018. ^ a b c d Nichols, Thomas M. The Russian Presidency: Society and Politics in the Second Russian Republic. ^ a b Rahr, Alexander (23 May 1991). "RSFSR CONGRESS ADOPTS LAW ON PRESIDENCY". www.friends-partners.org. Radio Free Europe/Radio Liberty. Retrieved September 19, 2018. ^ a b "RSFSR CP WANTS ELECTIONS POSTPONED". www.friends-partners.org. Radio Free Europe/Radio Liberty. 14 May 1991. Retrieved September 19, 2018. ^ Rahr, Alexander (21 April 1991). "RSFSR CONGRESS OF PEOPLE'S DEPUTIES OPENED IN MOSCOW". www.friends-parners.org. Radio Free Europe/Radio Liberty. Retrieved September 20, 2018. ^ Rahr, Alexander (24 May 1991). "YELTSIN SUFFERS SETBACK AT CONGRESS". www.friends-partners.org. Radio Free Europe/Radio Liberty. Retrieved September 23, 2018. ^ a b c d e f "No. 90, 13 May 1991". www.friends-partners.org. Radio Free Europe/Radio Liberty. 13 May 1991. Retrieved September 19, 2018. ^ "RSFSR PRESIDENTIAL ELECTION CAMPAIGN BUDGET". www.friends-partners.org. Radio Free Europe/Radio Liberty. 16 May 1991. Retrieved September 19, 2018. ^ a b c d Imse, Ann (11 June 1991). "Yeltsin ahead on eve of elections". news.google.com. The Free-Lance Star. Associated Press. Retrieved 30 September 2018. ^ a b c d e f g h i j k l m Urban, Michael E. (1992). "Boris El'tsin, Democratic Russia and the Campaign for the Russian Presidency". Soviet Studies. 44 (2): 187–207. doi:10.1080/09668139208412008. JSTOR 152022. ^ a b c d e "No. 88, 08 May 1991". www.friends-parners.org. Radio Free Europe/Radio Liberty. 8 May 1991. Retrieved 19 September 2018. ^ Foye, Stephen (4 June 1991). "DEFENSE MINISTRY: NO CAMPAIGNING BY DEMOCRATS". www.friends-partners.org. Radio Free Europe/ Radio Liberty. Retrieved 20 September 2018. ^ a b c d Rahr, Alexander (12 June 1991). "CONSERVATIVES ATTACK YELTSIN". www.friends-partners.org. Radio Free Europe/ Radio Liberty. Retrieved 23 September 2018. ^ a b Schodolski, Vincent J. (12 June 1991). "ELECTION-EVE SCANDAL HITS YELTSIN". www.chicagotribune.com. Chicago Tribune. Retrieved 30 September 2018. ^ Rahr, Alexander (11 June 1991). "UPDATE ON YELTSIN'S CAMPAIGN FOR PRESIDENCY". www.friends-partners.org. Radio Free Europe/Radio Liberty. Retrieved 23 September 2018. ^ a b Parks, Michael (11 June 1991). "Pravda Article Calls Yeltsin Power-Hungry, Unstable : Election: World chess champion Gary Kasparov urges a massive turnout for the presidential candidate Wednesday". www.latimes.com. Los Angeles Times. Retrieved 30 September 2018. ^ a b c Solovyov, Vladimir; Klepikova, Elena (June 1995). Zhirinovsky. Addison-Wesley Publishing Company. ^ "Russian Election Watch, Aug. 1, 1996". August 1, 1996. Archived from the original on 2000-01-28. Retrieved 2018-01-22. ^ Tolz, Vera (7 May 1991). "NEW PROBLEMS WITH RSFSR TV". www.friends-parners.org. Radio Free Europe/Radio Liberty. Retrieved 19 September 2018. ^ Rahr, Alexander (15 May 1991). "MAKASHOV AGREES TO RUN FOR RUSSIAN PRESIDENCY". www.friends-parners.org. Radio Free Europe/Radio Liberty. Retrieved 19 September 2018. ^ a b Tolz, Vera (April 29, 1991). "DEMOCRATIC RUSSIA NOMINATES YELTSIN FOR PRESIDENT". www.friends-partners.org. Radio Free Europe/Radio Liberty. Retrieved September 17, 2018. ^ Rahr, Alexander (April 21, 1991). "LIBERTARIAN PARTY DENIES RESPONSIBILITY FOR EXPLOSION". www.friends-parners.org. Radio Free Europe/Radio Liberty. Retrieved September 20, 2018. ^ "TATARSTAN SUPSOV MEETS AGAINST BACKGROUND OF PROTESTS". www.friends-partners.org. Radio Free Europe/ Radio Liberty. 28 May 1991. Retrieved September 17, 2018. ^ a b Ann, Sheehy (14 June 1991). "ELECTIONS IN TATARSTAN". www.friends-partners.org. Radio Free Europe/Radio Liberty. Retrieved 23 September 2018. ^ a b Rahr, Alexander (7 June 1991). "LATEST OPINION POLL ON RSFSR PRESIDENTIAL CANDIDATES". www.friends-partners.org. Radio Free Europe/ Radio Liberty. Retrieved 21 September 2018. ^ Rahr, Alexander (13 June 1991). "YELTSIN ELECTED RSFSR PRESIDENT". www.friends-partners.org. Radio Free Europe/ Radio Liberty. Retrieved September 23, 2018. ^ Rahr, Alexander (14 June 1991). "YELTSIN OFFICIALLY WINS, INVITED TO US". www.friends-partners.org. Radio Free Europe/Radio Liberty. Retrieved September 23, 2018. ^ "I Knew Boris Yeltsin". www.aljazeera.com. Al Jazeera. October 19, 2009. Retrieved September 30, 2018. The politics of Russia take place in the framework of the federal semi-presidential republic of Russia. According to the Constitution of Russia, the President of Russia is head of state, and of a multi-party system with executive power exercised by the government, headed by the Prime Minister, who is appointed by the President with the parliament's approval. Legislative power is vested in the two houses of the Federal Assembly of the Russian Federation, while the President and the government issue numerous legally binding by-laws. On the federal level, Russia elects a president as head of state and a legislature, one of the two chambers of the Federal Assembly. The president is elected for, at most, two consecutive six-year terms by the people. The Federal Assembly has two chambers. The State Duma has 450 members, elected for five-year terms, using a system of proportional representation, where parties gain a percentage of seats equal to the percentage of national votes they gained, with a 7% threshold required to gain any seats in the Duma. The Federation Council is not directly elected; each of the 85 federal subjects of Russia sends 2 delegates to the Federal Council, for a total of 170 members. The 2000 Russian presidential election was held on 26 March 2000. Incumbent Prime Minister and acting President Vladimir Putin, who had succeeded Boris Yeltsin on his resignation on 31 December 1999, was seeking a four-year term in his own right and won the elections in the first round. Nikolai Ivanovich Ryzhkov is a former Soviet official who became a Russian politician following the dissolution of the Soviet Union. He served as the last Chairman of the Council of Ministers. Responsible for the cultural and economic administration of the Soviet Union during the late Gorbachev Era, Ryzhkov was succeeded as premier by Valentin Pavlov in 1991. The same year, he lost his seat on the Presidential Council, going on to become Boris Yeltsin's leading opponent in the Russian Soviet Federative Socialist Republic (RSFSR) 1991 presidential election. According to the Constitution, the Russian Federation is divided into 85 federal subjects, 22 of which are "republics". Most of the republics represent areas of non-Russian ethnicity, although there are several republics with Russian majority. The indigenous ethnic group of a republic that gives it its name is referred to as the "titular nationality". Due to decades of internal migration inside Russia, each nationality is not necessarily a majority of a republic's population. The 1996 Russian presidential election was held in Russia on 16 June 1996, with a second round on 3 July. The result was a victory for the incumbent President Boris Yeltsin, who ran as an independent. Yeltsin defeated Communist challenger Gennady Zyuganov in the run-off, receiving 54.4% of the vote. His inauguration ceremony took place on 9 August. Amangeldy Gumirovich "Aman" Tuleyev, born 13 May 1944, is a Russian statesman. He served as governor of Kemerovo Oblast from 1997 to 2018 and became the chairman of the Council of People's Deputies of the Kemerovo oblast since April 2018. Colonel General Albert Mikhailovich Makashov is a Russian officer and a nationalist-communist politician. Alexander Vladimirovich Rutskoy is a Russian politician and a former Soviet military officer who led the putsch against President Boris Yeltsin during Russian constitutional crisis of 1993. The Russian Presidency of Boris Yeltsin, was the executive branch of the federal government of the Russian Federation from June 12, 1991 to December 31, 1999. The 1996 Gennady Zyuganov presidential campaign sought to elect the leader of the Communist Party of Russia, Gennady Zyuganov as President of Russia in the 1996 presidential election. The Vladimir Zhirinovsky presidential campaign, 1996 was the election campaign of Liberal Democratic Party leader Vladimir Zhirinovsky in the 1996 election. The Vladimir Zhirinovsky presidential campaign, 1991 was the election campaign of Liberal Democratic Party leader Vladimir Zhirinovsky in the 1991 election. Zhirinovsky ran on an ultranationalist platform. Widely unknown to most Russians at the start of the brief campaign period, Zhirinovsky ultimately managed a surprise third-place finish in the election. The 1991 presidential campaign of Boris Yeltsin, was the successful campaign by then-Chairman of the Supreme Soviet of Russia in Russia's first presidential election. Yeltsin ran as an independent candidate. His running mate was People's Deputy and former soldier Alexander Rutskoy. The Boris Yeltsin presidential campaign, 1996 was the reelection campaign of Russian President Boris Yeltsin in the 1996 election. The Nikolai Ryzhkov presidential campaign, 1991 was the election campaign of former Soviet Premier Nikolai Ryzhkov in the 1991 Russian presidential election. The nominee of the Communist Party, Ryzhkov was the strongest of several candidates running against frontrunner Boris Yeltsin in the election. Ryzhkov's running mate was Boris Gromov.